Working at a computer for the majority of the day can become pretty taxing. You don’t see the sun, feel a breeze, or hear the birds chirp. There are some days where you wish you could just pull your work outdoors, but if you have a balcony, where are you going to put it? The Balcony Table is a multi-functional table that will fit any balcony railing that is less than 60mm thick. This means you can finally type away and see the clouds in the reflection on your screen. 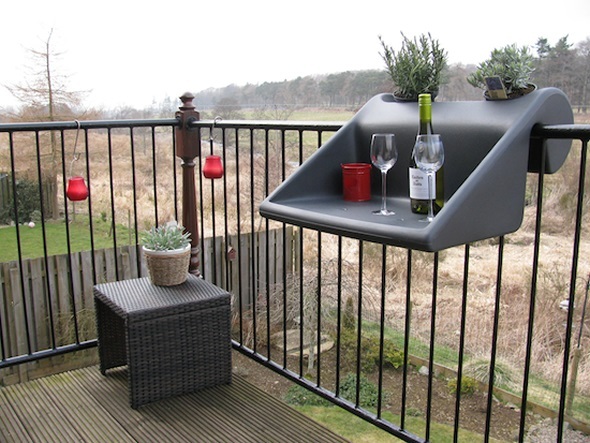 Of course, this would be useful in many other situations as well, such as a place to put snacks during a party, potted plants, and just a good spot for a cup of tea with a view. This will cost you around $180, and is made of polyethylene that is weather-resistant. I feel duty bound to say… A hundred and thirty eight euros!! Are you mental? I could hire someone to stand there with a tray for less money! A hundred and thirty eight euros? A hundred and thirty eight euros? Really? For a bit of plastic? A hundred and thirty eight euros. Sheesh.